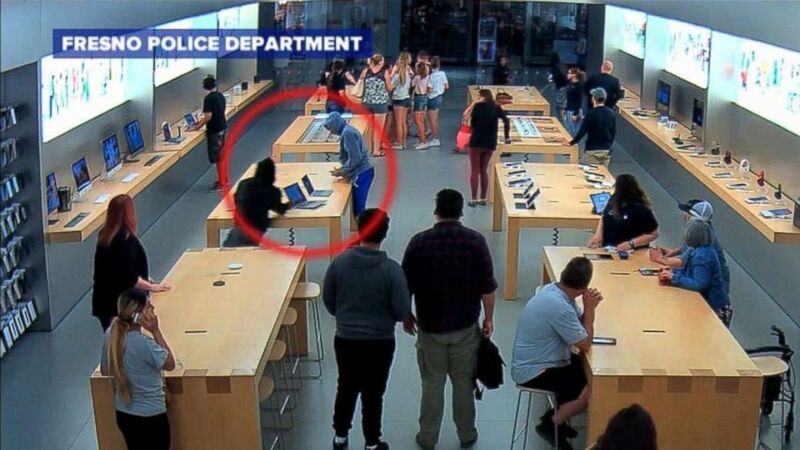 Police are investigating a string of robberies at Apple stores in California. Five suspects are due to appear in court today after allegedly stealing $18,000 in iPhones and laptops from an Apple store in Thousand Oaks, California, police said. Authorities are investigating whether the suspects are also responsible for a string of other recent robberies at California Apple stores. Five people ages 19 to 26 were arrested in connection with the alleged robbery on Sunday afternoon, the Thousand Oaks Police Department said in a statement. The suspects had allegedly entered the store wearing sweatshirts with the hoods up as they grabbed merchandise, according to police. A group of customers helped apprehend two of the suspects at the Thousand Oaks store by holding them down as they attempted to flee, police said. (Fresno Police Department) The two people seen in this inset allegedly ran into this Apple store stealing merchandise worth thousands of dollars. Police then stopped a car in Simi Valley that was traveling at high speed and discovered Apple merchandise allegedly from the Thousand Oaks store and a Los Angeles Apple store, Thousand Oaks police said. The driver and two passengers were arrested, according to police. All five suspects are due to appear in court at 1:30 p.m. local time Tuesday, police said. Authorities are now investigating whether the suspects have been involved in other recent robberies of California Apple stores. "At this point, we think that they are involved in other burglaries, three of them in Thousand Oaks, and then one in Northridge," Capt. Garo Kuredjian of the Ventura County Sheriff's Department told ABC News. On July 7, four people stole more than $27,000 in Apple products from the Fashion Fair Mall in Fresno, the Fresno Police Department said on its Facebook page. Kuredjian said that his department is working with other police departments to see if the five suspects arrested Sunday have also been involved in burglaries in other areas. "We are still looking to see if they are linked to other burglaries as well, but we don’t have that information yet," Kuredjian said. An Apple spokesperson said the company does not comment on security matters.